Spout expandable up to 20 in. Clean lines and cylindrical modern design make the New Essence Pull-Out Dual Spray faucet the natural choice for today's cosmopolitan kitchen. The extended comfort spout height embodies minimalist beauty in its purist form, while the new 28 mm cartridge allows for a sleeker, more refined body, the new integrated temperature limiter can be individually set to the desired maximum water temperature to prevent scalding. The durable and attractive StarLight finish ensures a scratch and tarnish-free surface for a lifetime. Flowing lines and a high-arcing profile give the Ladylux3 Pro single-handle pull-down spray head kitchen faucet singular presence in any contemporary kitchen. The 16 9/16-inch-tall faucet boasts an 8-9/16-in. swivel spout reach and a pull-down sprayhead with locking spray control and a push button that allows users to transition between two spray modesregular flow and spraywith ease. GROHE SpeedClean protects the spray nozzles against limescale buildup. Water temperature and volume are controlled with effortless precision via a side-mounted lever handle equipped with a GROHE SilkMove for a lifetime of smooth operation cartridge. To turn the faucet on, the lever handle rotates forward, thus avoiding problems with backsplash clearance. Ladylux3 Pro has a flow rate of 1.75 GPMand comes in GROHE StarLight finish for scratch and tarnish-resistant surfaces for a lifetime of beauty chrome, a brilliant finish that will not scratch or tarnish. 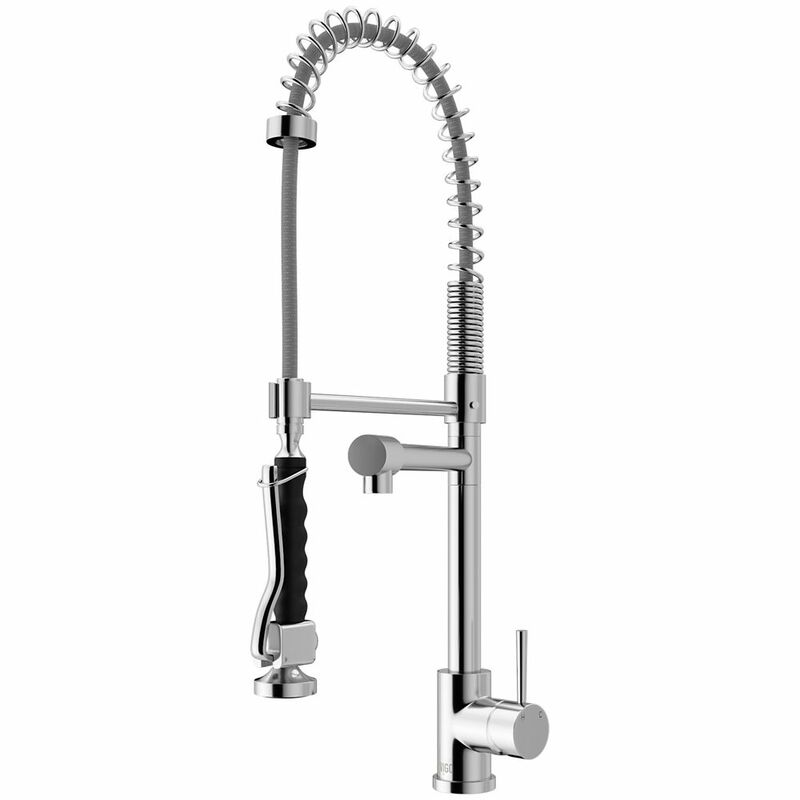 Chrome Pull-Down Spray Kitchen Faucet Accent your kitchen by adding this stylish yet durable Vigo faucet. Includes a spray face that resists mineral buildup and is easy-to-clean. Vigo finishes resist corrosion and tarnishing, exceeding industry durability standards. Chrome Pull-Down Spray Kitchen Faucet is rated 4.6 out of 5 by 427.